This book has been years in the making and it’s a whopper, but don’t think that it’s all filled with fluff. I have poured my heart and soul into this puppy so that I can pass my knowledge on to you. Did you know that the number one reason why jewelry artists fail at craft shows is that they don’t know how to choose successful shows? After failing, most quit without ever knowing why they can’t get customers to buy their designs. Imagine if you could bypass the common mistakes and learn to effectively present and sell your work before booking your first show. Jam-packed with useful know-how, from a seasoned professional, Craft Show Business reveals how to sell jewelry using proven strategies for success, how to avoid bad shows and how to grow a succesful jewelry business. There are a ton of craft show tips out there, but unfortunately, much of that advice does not dive deep into the most valuable how-to details that will bring you the most success. And some advice is just plain bad such as putting candy or treats out for visitors. We all want to attract the serious buyers, not only those who want free stuff. Save your candy dish for the wholesale shows and start learning how to serve your customers using strategies that bring in sales! With over 25 years in the business, at over 300 shows, the craft show tips in this book will open your mind to the possibilities with useful and practical time-proven strategies. Discover proven methods for selling your jewelry, growing your perfect customer base and for building a successful jewelry business. The 60 plus pages in the “Proven Selling Strategies” chapter alone will transform your perception with pivotal information that puts you in charge of your sales. and take the Crapshoot out of Craft Shows! Discover how your money blocks and old scripts hold you back from having a thriving business... and much more! "The book consistently came across as an in-depth guide to the craft show business. Everything from booth design, booth location, preventing theft, time saving production methods, how to build a customer base to maximizing your year round income seems to be all covered and then some. If a craft show business topic was omitted, I certainly couldn't find it." "A substantial part of the book- approximately 40% - is devoted to selling strategies and it is what makes this book truly outstanding and unique for jewelry sellers especially those who haven't been in sales before." "Highly recommended. A must read for any one serious about selling jewelry in person." You can avoid the most common craft show mistakes when you prepare yourself with the right knowledge. 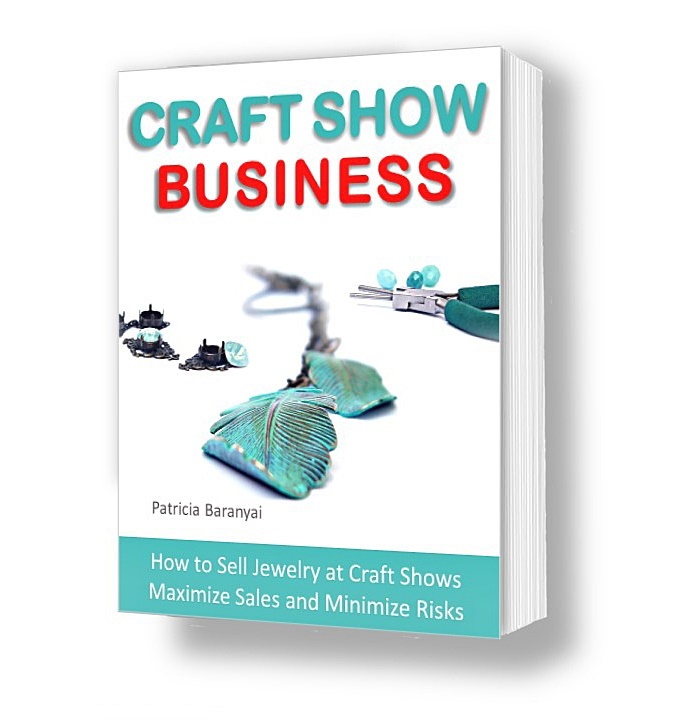 The craft show tips contained in this book will give you an insider’s grasp, arming you with crucial insights on how to sell jewelry at craft shows and have a booming business. Craft Show Business is the essential guide, detailing the exact strategies I learned the hard way. I made all the mistakes. You don’t have to. Think of all the possibilities when you can set up for success, right from the beginning, using time-proven strategies. Cut through all the common blunders you need not make and eliminate wasted time and money. Build a jewelry business you can count on starting now and avoid the misconceptions that will keep you from having the business of your dreams. Let this be the year you finally get your collection out there and into the hands of your customers. Pick up Craft Show Business on Amazon and get started Today!